Stylishly Decorated & Cozy 3BR / 3 BA Condo - Ski-in / Out! We invite you to enjoy our wonderful vacation home nestled below Lone Peak in the Mountain Village of Big Sky Ski Resort. 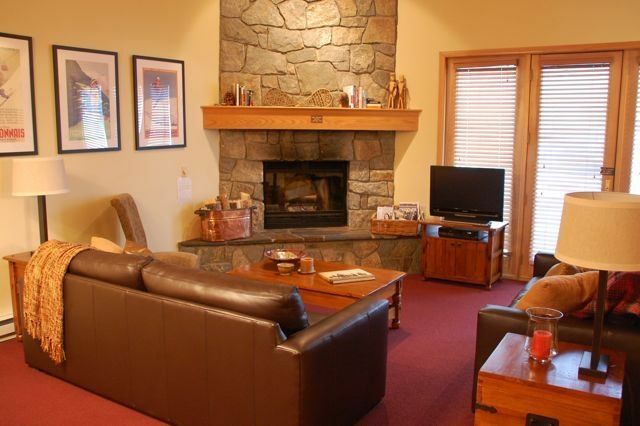 Ski-in/Ski-out convenience makes this condo perfect for families. POMA lift access to Big Sky resort area only 150 yards away. Come and go as you please! Just a quick walk to nearby shopping, dining and après ski fun! Short drive to the newly developed Moon Light Basin Ski Resort. Big Sky is not only about winter activities. Summer can be the most relaxing and scenic time to visit Big Sky, especially when the wildflowers are in bloom. Whitewater rafting, mountain biking, horseback riding and fly-fishing are just a small sampling of the activities available. This 2 story vaulted condo features private ground level entrance, 1 bedroom with a queen size bed and a full bath, 1 bedroom with 2 double beds and a full bath (great for kids) and a spacious master bedroom with a king size bed, desk, seating area, walk-in closet and a full bath. This condo is elegantly decorated with new slate floors in the foyer and kitchen, fresh colors, new carpets, new furniture and wonderful iron beds. All this centered around a large stone fireplace in the great room and french doors which lead out to a deck. Our home offers a warm and relaxing atmosphere after returning from a great day of outdoor activities. You can pull into the attached heated garage and unload or prepare your gear in comfort. If you're hungry and feel like eating in, the kitchen is fully equipped to cook for a crowd, or better yet, there is a variety of great restaurant choices in the Big Sky area. We also have free Wireless DSL High Speed Internet. All in all, with 100 trails covering 3600 acres of uncrowded terrain, we think Big Sky is the best year-around resort in America and is by far the most family-friendly! One hour from Yellowstone Park and Historic Bozeman. Less than 50 miles to (BZN)Bozeman airport. Come visit Big Sky Country! Free DSL Wireless Internet, 4 Cable TVs, 4 DVD's, HEATED 1-Car Garage, Deck, No Smoking!
. We had a really hard time parking last night as the driveway isn’t cleared at all. There’s serious Mold in the master bath, and all other bathrooms. So disgusting and the smell permeates the rooms. It was really hard to drive on the parking spot and it’s not cleared. No hand soap for sinks, and dirty dishes were put away in the drawers. There is no Kleenex and there’s still towels in the dryer. It seems to me that these things should be ready for when we arrived. Not sure if the cleaning people and management people aren’t doing their job but really frustrating as a guest. Made it challenging to get in last night and park and unload as well as getting ready this morning when we needed to wash dishes before making breakfast. I sincerely apologize for all the snow we have had at Big Sky this year! It made parking difficult, as there is a car parked in the parking spot 90% of the time, and the roofs had shed due to the warm weather that week. I park there constantly with no issues as does everyone else. Keep in mind the condo is at 8000’. I also apologize for the clean towels in the dryer. We had a back to back that day....As for the 2 square inches of mold, renters can have a hard time keeping the shower curtain closed.... when you complained about the lack of tissues, I replied immediately that there were a dozen boxes in the closet... you can’t please everyone.. it’s not the 4seasons, but please see all other reviews.. can’t please everyone all the time. Access to lifts very convenient. Condo had ample space for 6 adults and contained most everything we needed. Chris was very easy to work with including helping us with some special requests. Big sky mountain is an incredible place to ski! We enjoyed this condo and thought it was a great value for the money. The location was convenient for skiing and we loved having the large mud room entry way for our boots, coats etc. Having a heated garage is awesome! We stayed with 4 adults and 4 kids and had plenty of room. We had a great visit to Big Sky!! This house is located close to the pommel lift which makes it almost a ski in/out. The room set up with three bathrooms were perfect for our group of three couples. The kitchen had all the utensils needed or enough you could improvise. The carpet is a bit worn as is the bathroom floors, caulk, grout. Beds comfy. Big sky skiing was awesome. Big Sky is awesome! SO MUCH SNOW! This place was super convenient to Big Sky Resort and an easy drive to the Madison Base (Moonlight Basin, which we LOVED). Although not truly a ski-in/ski-out, we loved the condo! There were 5 of us, and we had plenty of room for more. Within 5 minutes of our arrival, we had the first visit from the friendly neighbourhood fox. He ended up coming at least twice a day, perching right outside the back door/windows. We named him Red, LOL. The owner was super helpful.... kitchen was well-stocked with equipment and spices and coffee supplies. Towels and linens were super comfy which was a big plus for me. I'd suggest Milkie's for awesome local pizza, Buck's T-4 Lodge for a great steak and wild game, and Montana Jack's off-the-slopes for good food, music and drinks. Plan to stay for a week if you want to ski all there is to ski because the skiable area is HUGE...you couldn't possibly see it all in less time than that. We had 4 adults. The condo worked very well for us. Spacious. Good beds. The owner converted the second room upstairs into a king so that was very nice. We had several nice fires. The Poma lift is a short walk away. It was not possible to ski in and out of the unit. Big Sky itself was amazing. Great snow and beauty. Can’t wait to return. Access to nearby Fitness Center/Health Club for no additional charge! Hiking, Fly Fishing, Snow-Cat Skiing, Sledding and more!